PLANO, Texas, March 29, 2018 /PRNewswire/ -- Canada Dry launched Canada Dry Ginger Ale and Lemonade, a new, delightful flavor combination. Made by the #1 brand of ginger ale, it combines flavor made from real ginger and a splash of lemonade made with real juice, for the ultimate crisp and refreshing taste. "Canada Dry has seen eleven years of consecutive growth, which is a testament to our consumer loyalty and ability to develop great tasting flavor combinations, taste-tested and approved by our consumers," said Dave Falk, VP Marketing for Canada Dry. "Relaxing with a Canada Dry has always been part of its heritage," said Doris Chung, SVP, Creative Director at Deutsch. "With the launch of its new product, Ginger Ale & Lemonade, we were able to bring this concept to life through 'Ginger Man.' We're excited to debut this modern guru and share the secrets of relaxation with the world." The new digital and television ads – created by Deutsch – will feature a new character, 'Ginger Man.' The likeable guru played by Cullen Moss is on a mission to give consumers guidance on how to taste nirvana. The Ginger Man character will accompany an integrated campaign consisting of national television commercials, audio streaming program advertisements, and an extension across social, digital and media channels. Canada Dry Ginger Ale and Lemonade can be enjoyed on its own or used in drink recipes for a refreshing punch or cocktail. 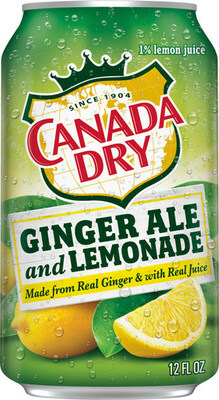 To learn more about Canada Dry Ginger Ale and Lemonade and for delicious drink recipes, visit www.canadadry.com. Pick up a Canada Dry Ginger Ale and Lemonade at your local retailer today to unwind and experience the real ginger and lemonade taste. Canada Dry, a brand of Dr Pepper Snapple Group (NYSE: DPS), is a leader in great-tasting carbonated beverages. Founded in 1904 in Toronto, Ontario, by John McLaughlin, Canada Dry Ginger Ale is enjoyed by fans for its real ginger flavor. The Canada Dry portfolio also includes club soda, tonic water, sparkling water and other flavored beverages. DPS is a leading producer of flavored beverages, marketing Canada Dry and 50-plus other brands across North America and the Caribbean. For more information, visit CanadaDry.com or DrPepperSnapple.com. For the brand's latest news and updates, follow Canada Dry at Facebook.com/CanadaDry.